Dentists Directory Canada-DDC > 3.n.One, AbsoLute, Access, Applicator Accessory, Applicators, Automix, Benda, C-R, Calciject, Caries Indicator, Cements, Chamo, Composite Materials, Connexio, Core Buildup, D/Sense, Delivery Systems, Desensitizers, Disposable Tubes & Plugs, Encore, Endodontics, EndoKit, Etching Material, EveryBond, Expose, Finishing and Polishing Instruments, FluoroDose, GingiCap, GingiTrac, Gingival Retraction Material, Glu/Sense, GripStrip, Impression Materials, IsoVue, LolliCaine, LubeCube, Luer-Lock Needles, MicroAspirators, Min-Identoflex, MiniMix, Mixing Nozzle Tips, Mixing Nozzles, NoMix, Onyx, Preventative, ProxiDiscs, RapidCore, Reflective Oral Devices, SofNeedle, Standard, SuperCure, Tempit, Temporary Crown & Bridge Material, Temporary FIlling & Seals Materials, Topical Anesthetic, VersaFlo, VersaLite, Zip-Zip-Go > Centrix Inc.
Centrix was created in 1970 from an idea of Dr. William B. Dragan’s to bring to the dental profession an easier way to deliver composite resins and cements from the mixing pad to the tooth. The new composite materials so impressed him with their vast potential in his dental practice, that he knew a simple, efficient, and effective way of delivering composite was a must for the dentist. After much experimentation, and trial and error, Dr. Dragan developed and patented the first practical syringe delivery system for composites in 1970. This was the original Mark I syringe and the CR® (Composite Resin) tube and plug. The initial desire for the product was to interest large dental manufacturers of composite to take his idea, develop and manufacture it for the dentist. His efforts to interest any of these manufacturers was met with total indifference. This very indifference inspired Dr. Dragan to create his own development, manufacturing and marketing company. The goal of this company would be to create products aimed at helping the dentist in his everyday practice. This undertaking was begun with a simple product, the Mark I™ all stainless steel system with disposable CR tubes and plugs. Many people have asked about the origin of the company name Centrix. Dentistry has always recognized that the beginning of all jaw movement begins from a position of the jaw known as the Centric relation. This being a new and start up venture, Dr. Dragan took the word Centric, changed the last letter from “c” to “x” and created Centrix. 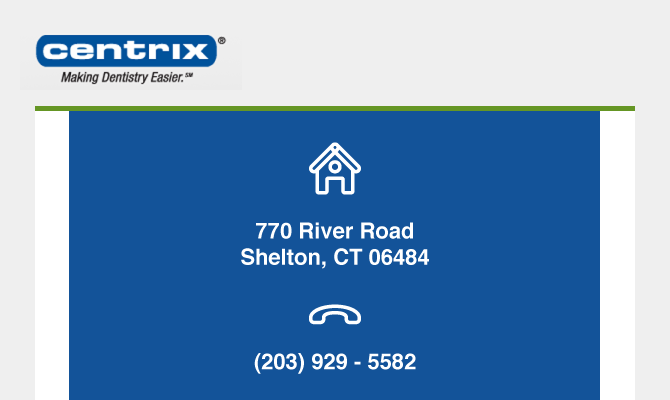 Centrix continues to grow, beginning from Dr. Dragan’s basement in 1970 to a modern facility in Shelton, Connecticut, becoming a leader in listening to the demands of the Dental profession. Through all these years there have been many changes, improvements and challenges that have helped Centrix to grow while always keeping an eye on the quality of the product and simplicity of use.